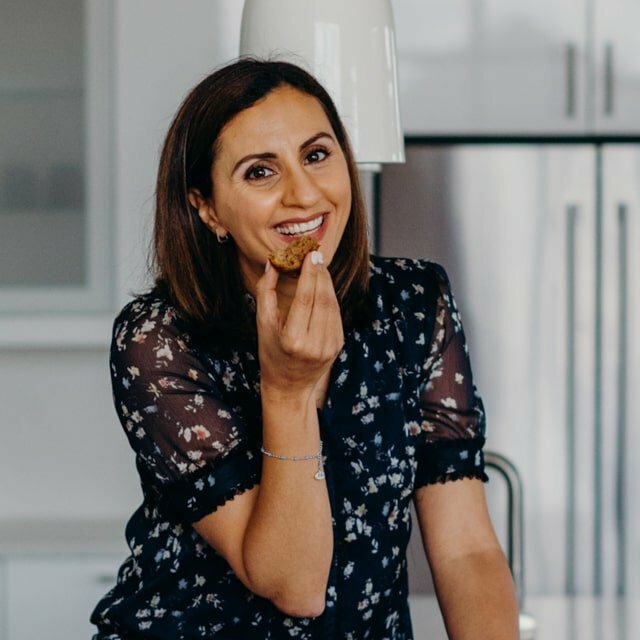 Growing up in a Lebanese family, we loved eating sambousek, which is a popular cheese-stuffed pastry that’s fried and fabulous. When we moved to the U.S., my mom started embracing alternatives to traditionally-fried foods, and we pretty much never did any deep frying in my house since then. It was something we enjoyed when we were out at restaurants but not so much at home. I remember when my mom first bought egg rolls wrappers from the store and made Chinese inspired spring rolls. Then another time she was missing a couple ingredients and made some substitutes, and again more substitutes until we started calling them surprise rolls! And one day, zaatar spring rolls were the best surprise ever!! Till this very day, we all love when my mom makes surprise spring rolls. And I started making them in my house as well because I could use leftover chicken, cheese, vegetables or whatever, roll them up, pop them in the oven and produce the best appetizers ever! 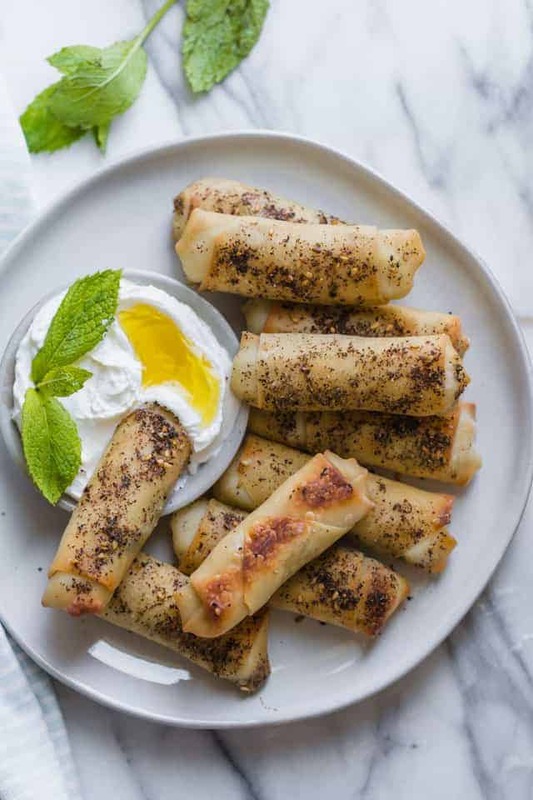 What ingredients do you need for zaatar spring rolls? For this sambousek recipe, I use halloumi cheese because it’s dubbed “the non-melting cheese”. Halloumi cheese is my fave! It literally doesn’t melt so you can fry it, bake it, saute it and it will retain its shape! I also add mint leaves on the inside. Then I use wonton wrapped to wrap everything and sprinkle zaatar on the outside. 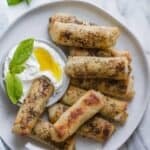 How do you make zaatar spring rolls? 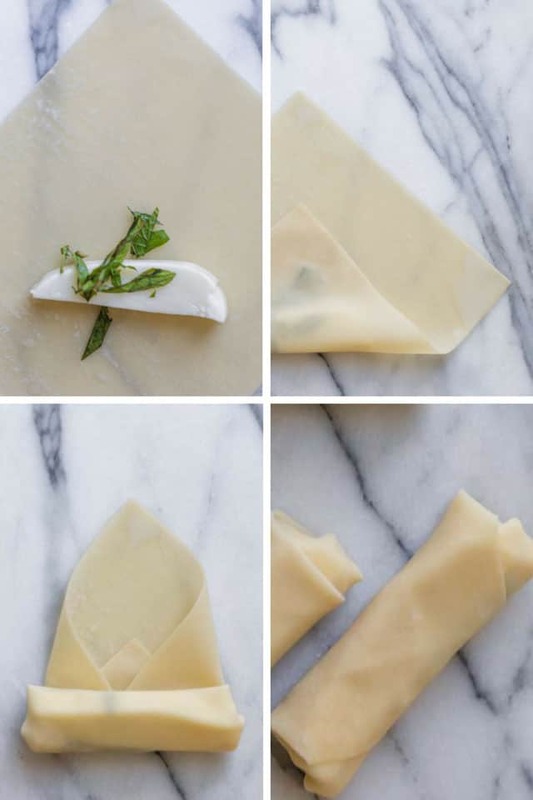 Place a slice of cheese (about the thickness of your index finger) along with mint in the middle of the wonton wrapper. Then roll it up while slowly tucking in the corners as you roll. Then, I roll it up, spray it with olive oil and sprinkle the zaatar spice. Next, place them on a baking sheet lined with parchment paper and bake in the oven, but you can also fry them if you prefer. and utterly addicting all over! 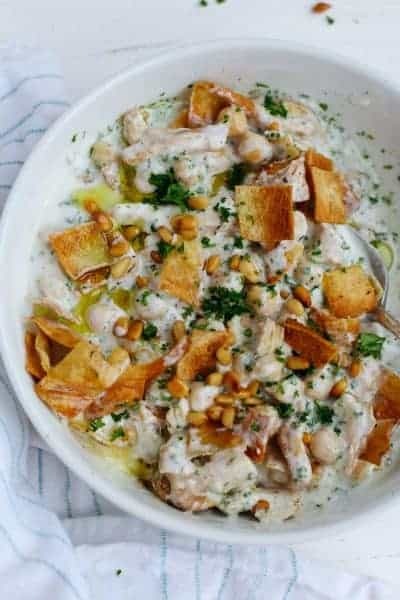 Dip them in labneh (Arabic yogurt cheese) for a perfect bite! 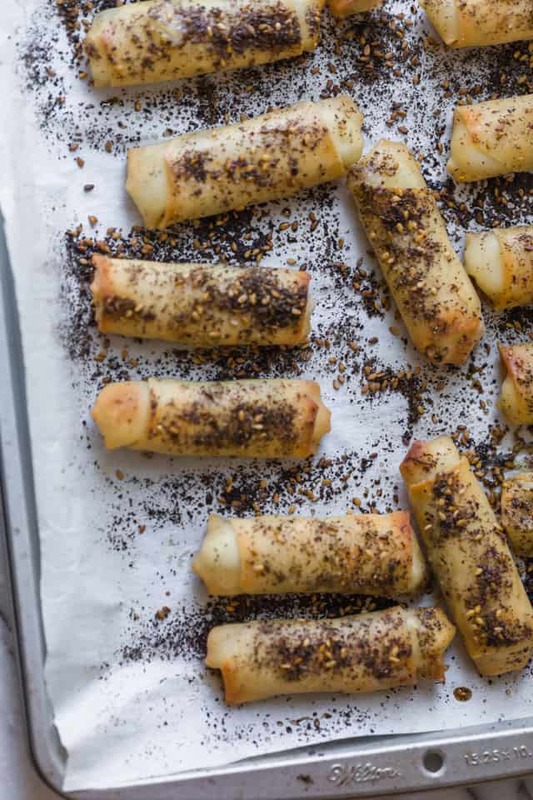 If you’ve tried this healthy-ish feel good Zaatar Spring Rolls recipe or any other recipe on FeelGoodFoodie, then don’t forget to rate the recipe and leave me a comment below! I would love to hear about your experience making it. And if you snapped some shots of it, share it with me on Instagram so I can repost on my stories! 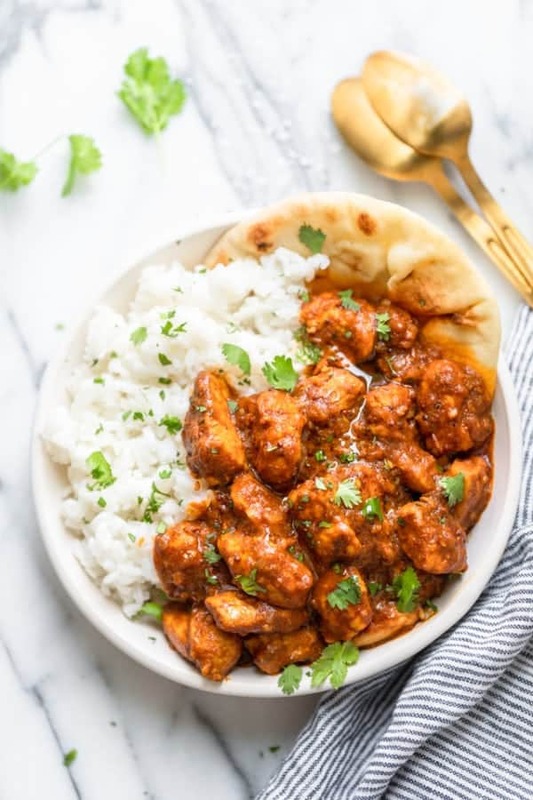 The post was updated on May 30, 2018 to include a video recipe and new photos. Cut the halloumi or other white cheese block into slices about the size of your thumb. 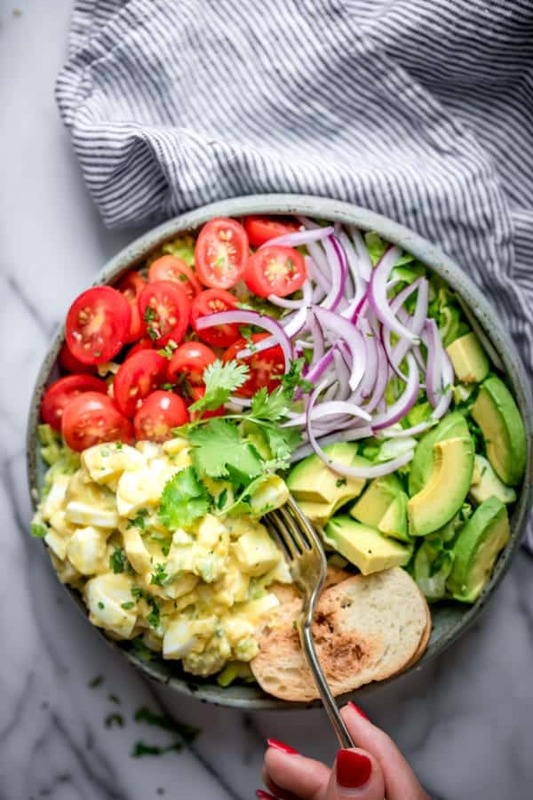 Arrange the egg roll wrappers on a dry cutting board or other working surface, and position them at an angle so that the corner of each wrapper is closest to you. 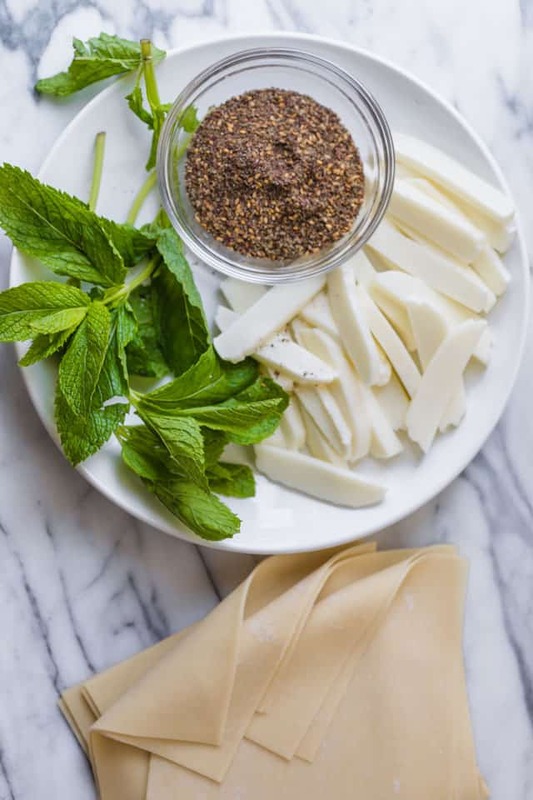 Place a slice of the cheese at an angle in the lower third of each spring roll wrapper, and sprinkle with the fresh mint. Dab your fingers in the bowl of water and rub it around the edges. Beginning at the bottom angle closest to you, roll the wrapper up and fold the edges inward along the way. Roll the wrapper shut, adding a dab of extra water if needed. Press lightly to seal the edges together. 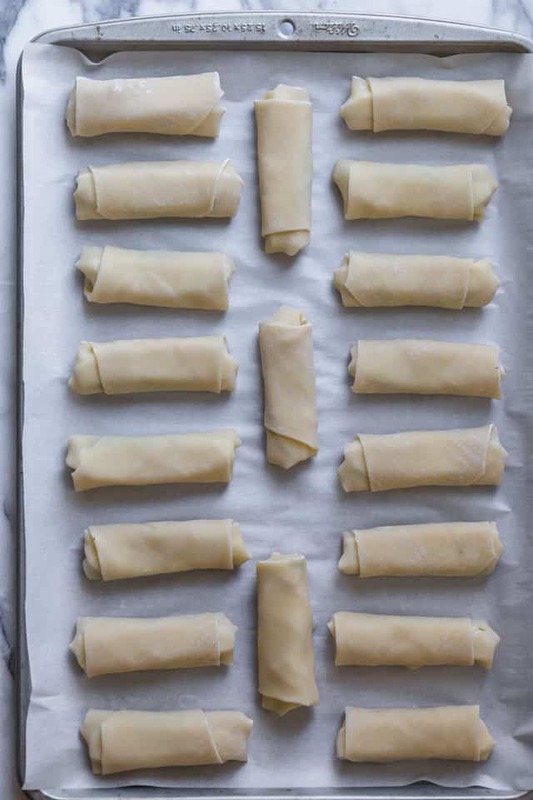 Place the stuffed eggs rolls seam side down on the prepared baking dish, and repeat with the remaining wrappers until complete. 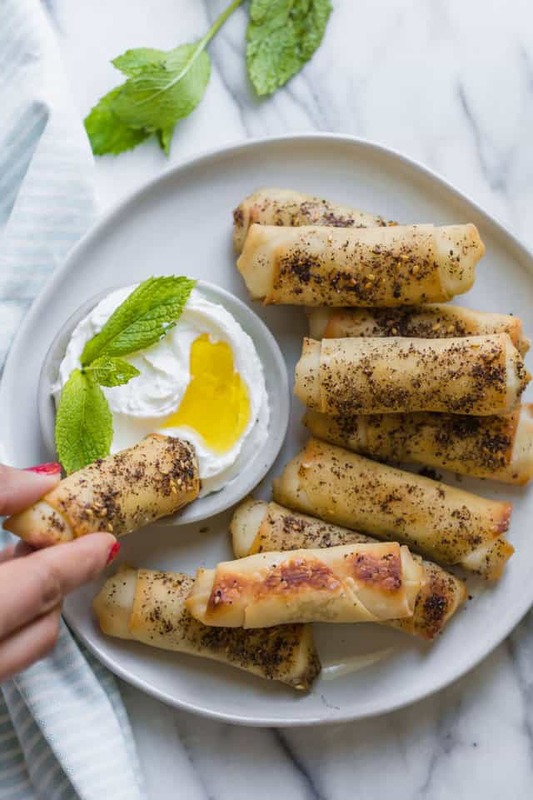 Brush the egg rolls lightly with olive oil or coat them with cooking spray, then sprinkle the zaatar spice. Bake in the preheated oven until they are golden brown and crisped on the outside, about 15 minutes. Serve with labneh yogurt cheese, if desired. If you can’t find halloumi cheese or Syrian cheese, you can use any other table white cheese of your choice (like mozzarella). However, since these other cheeses will melt, I would advise you to freeze the egg wrappers before baking in the oven to keep the cheese intact in the middle. Or you can use a smaller size cheese portion in the wrapper. For best results, I would recommend that you thaw wraps at room temperature before using so they don’t easily break while handling them. 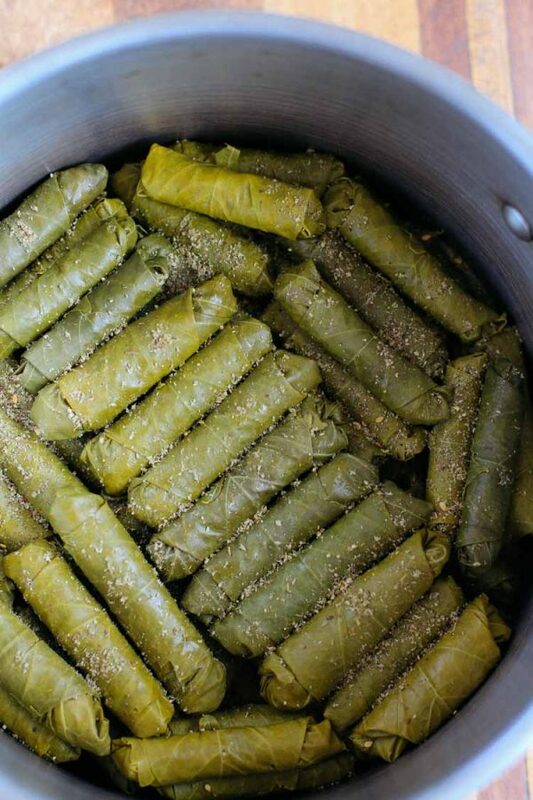 If you prefer to fry these, you can heat the oil to 350°F and place rolls flaps down a few at a time in a large skillet, and fry until golden. 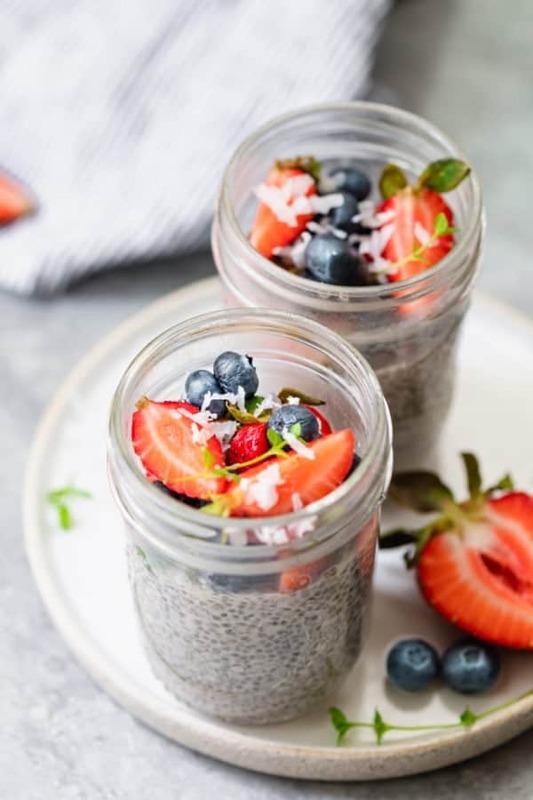 If you have any leftovers, which is highly unlikely, you can store them in an airtight container for up to 7 days. You can reheat them in a toaster oven to get them crunchy again. Do you think these would still hold up well if you added another element inside the rolls such as hummus?